McPixel is a save-the-day guy that you guide through 100 20-seconds challenges in an oldschool point'n'click fashion. The levels are passing as you play with no way to stop them. Each of them eventually exploding. 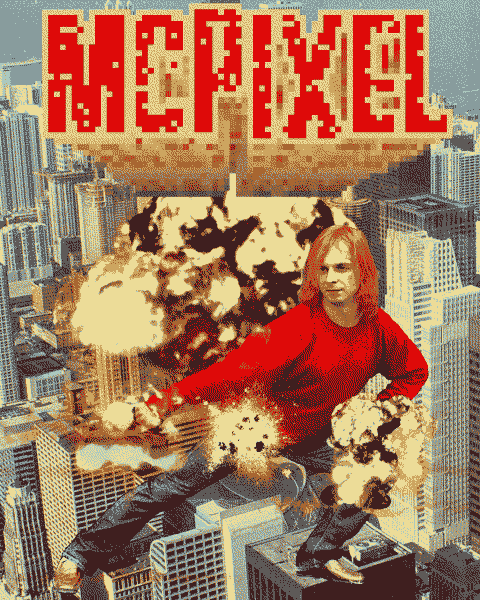 Your task is to guide McPixel through the levels saving the day each time. Even if you fail tho, you will be taken on to the next level and only when you make a full round through the batch of 6 levels, you will be able to try again. Visit the game website to play the demo! Sorry for all the confusion! Thanks for the help fro Desura, I will be able to provide everyone who bought the game here with Steam redeem codes! Stay tuned! Also everyone who buys the game her ein the future will also receive the code! Apologies for being late with that, but anyweays, all's well that ends well! Please don't hate me! This was the first greenlight game i voted for! Great to see it still being a hit! Funniest game in years, Absoloutley fantastic. You mean thx it is pretty cool but downloaded it from steam. I really enjoyed the game, though a little too gross sometimes even for me. Very good fun anyway! I remember seeing this game on Greenlight. I'm glad to see it got aproved. We need the updated version for Linux also!!! McPixel is Sam&Max on steroids. It's fast, furious, insane, ridiculous, hilarious, over-the-top, explosive, beautiful, inventive, original. McPixel is point-and-click. Superlative point-and-click. Playable in small bites, highly brain-damaging in big chunks. Sos Sosowski at his best. There's no word for this stuff. Play it, that's all.